Dr. Joseph Seabrooks, Jr. was appointed as the president of Cedar Valley College in 2017. Prior to joining Cedar Valley, he began his tenure as president at Metropolitan Community College-Penn Valley in 2011; he was appointed president of MCC-Blue River in 2007. Before he joined MCC, Dr. Seabrooks served as assistant vice chancellor for student affairs at the University of Arkansas–Fayetteville, where he was responsible for the Enhanced Learning Center, First-Year Experience programs, international students and scholars, the Off-Campus Connections office, student support services and pre-college programs. He also served the University of Missouri-Kansas City for more than 10 years in a number of capacities, including assistant director for alumni relations, director of minority student affairs and executive director for the Diversity in Action office. The Atlanta, Georgia, native holds a bachelor’s degree in psychology; a master’s and educational specialist degree in higher education administration; and an interdisciplinary doctorate in urban leadership, policy studies and education administration, all from the University of Missouri-Kansas City. 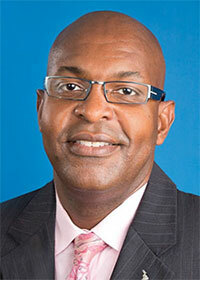 Dr. Seabrooks completed the AABHE Leadership and Mentoring Institute in 2006. Dr. Seabrooks is the recipient of numerous awards and honors, including: the 2016 Phi Theta Kappa (PTK) Shirley B. Gordon Award of Distinction; PTK’s 2015 Distinguished College President Award for the Missouri region; the 2013 Business Partner of the Year Award, Guadalupe Center Inc., which was presented for MCC-Penn Valley’s outstanding contributions to the Hispanic community in Kansas City; and, among others, the 2013 ACE Award from the Greater Kansas City Chamber of Commerce, presented annually to culturally diverse mid- to senior-level managers who achieve excellence and have an impact that exceeds expectations for their employers and the company’s bottom line. Dr. Seabrooks was inducted into the Black Achievers’ Society of Greater Kansas in 2010. A leadership award was established in his name at the University of Missouri-Kansas and is given annually to a UMKC professional for exceptional dedication, service and empowerment which he or she provides to the university’s students. Dr. Seabrooks was the inaugural recipient in 2005.